2012 Cipes Rosé - Rosewater and juicy raspberry on the nose; full mousse of long-lasting bubbles; dry palate and tart finish. N/V Cipes Brut - Aromas of sweet pear and lychee with lighter bubbles than the rosé. This is Summerhill's flagship wine, and no matter how you feel about biodynamics, organic winemaking or the like, this stuff wins medals year after year, so they must be doing something right. 2012 Riesling - Medium straw colour. Aroma profile was more like a sauvignon blanc, with lots of citrus and gooseberry. But the off-dry tropical fruit abounds on the palate, with a slightly sour meyer lemon finish. 2010 Old Vines Sparkling Riesling - Light and airy on the nose: tangy green apple and flint; the high acidity and plentiful bubbles makes it a refreshing palate cleanser. Tart apple finish grips the back of the throat. 2012 Pinot Meunier and Pinot Noir Rosé - After spending eight or nine days on the skins, the meunier was supplemented by pinot noir (done in the saignée, or "bleeding off" style), creating a dry wine of roses and tart cherry with an undercurrent of strawberry and crisp, zingy acidity. 2012 Ehrenfelser - The Germans created this cross between sylvaner and riesling, hoping for an early-ripening grape, but it didn't work out that way. What came out had fragrant floral, honeydew and coconut aromas, a smooth and soft mouth feel and loads of green apple, melon and lychee. Only 400 acres of ehrenfelser are left in the world. 2011 Block 5 Chardonnay - This is the "front yard" wine, what with the vineyards growing just outside the winemaker's house. Tropical nose with just the faintest whiff of butter gives way to creamed honey, butterscotch and more pineapple and coconut. Aged in 500-litre barrels with no malolactic fermentation to reduce the impact of the oak. 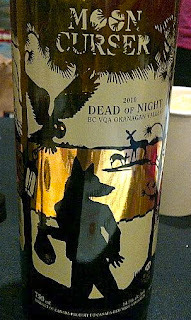 Moon Curser 2010 Dead of Night (Osoyoos East Bench) - Head and shoulders above the rest, this was my favourite red of the conference. Grippy tannins, muscular heft on the palate, beefy and full of attitude. I want this with a steak, for sure. The label's gorgeous, too. Therapy Vineyards 2012 Fizzio Therapy (Naramata Bench) - A unique blend of 90% chardonnay and 10% muscat, adding a floral, mildly sweet element to bracing acidity and an orange-zest finish. Gray Monk Winery 2012 Pinot Gris (North Okanagan Valley) - Top-selling pgris in Canada, this is a beaut with orange blossom and wet stone on the nose, followed by a flash of acidity that tempers the residual sugar. Gray Monk Winery 2010 Odyssey Merlot (Black Sage Bench) - From the oldest wine growing operation in the Okanagan, this impressive merlot is all about elegance in its muted fruit and light tannins. Adega Estate Winery 2012 Pinot Gris (Oliver) - What can I say, I'm a sucker for B.C. pinot gris. This one had a surprising nose of white chocolate and hemp that led into a mouthful of pear and Meyer lemon with just the right balance of acidity to finish on a crisp note. Oliver Twist 2012 Oliver's Choice (in - where else? - Oliver!) - Kerner is a cross between trollinger and riesling, a hefty, off-dry white replete with tangy grapefruit, honey, spice and spring blossoms in full bloom. Covert Farms 2012 Rosé (Oliver) - Exciting blend of merlot, pinot noir and syrah gives off notes of peach fuzz, rhubarb and strawberries; dry with a peppery and zesty mouth feel and a short, brisk finish. If you're not a rosé drinker cuz you think it's a sugar-sweet, you NEED to try this one. Stoneboat 2011 Solo Pinotage Reserve (Black Sage Bench) - The rep from Stoneboat described this as an Okanagan 'fruit bomb' but it still retained plenty of the varietal's character in its structure. Jackson-Triggs Okanagan Estate 2012 Reserve Series Rosé - I loved carrying around my glass of this while strolling around the grounds at the Constellation opening night party. It went well with everything. Lush strawberry and raspberry notes with a slight herbaceous character, light-pink ruby in colour, mostly dry with a wee smidge of sweetness in the currant/cherry flavour profile. Tart and tangy finish. Tinhorn Creek 2012 Oldfield Series 2Bench Rosé - This was AH-MAY-ZING. Light salmon colour, dry, perfect for the patio (or porch, couch, park bench ... anywhere your rump happens to be resting, but preferably in the late-day golden glow of the setting sun.) Could I find any at the VQA store in Penticton? No. Am I kicking myself that I didn't buy any at the winery? Yes. Will I "break the law" and order some direct? You figure that out.